I have so much to share from the ConvenZioNE last week that it will take a few days. I of course had to journal about the event, so I will start with one of my pages. I needed to take some images to use in the projects I did in the workshops, so I used some of those in my journal, prepping a few pages with some paint to be added to later. This page reflects my online, friendships with some of the people there. I knew them by name, but had never met any of them. A little scary, but the instant I met these ladies, I felt right at home. We all share the bonds of creativity and it is evident when you walk into a room full of amazing artists. This piece was done in Brandie Butcher-Isley’s class. She is an inspiring artist who’s work I have admired for a long time. We met right away and hung out together for the whole event. We will be doing some collaboration on projects in the future and left with our minds full of ideas. Brandie truly has the soul of an artist and there was an instant connection that I will always cherish. This piece also serves as my response to last weeks Melange Team Challenge, FUN, as I can’t think of anything more fun than being in the land of ZNE! The other workshop that I took, was Anna Corba’s class. She lead us into her world of lovely vintage papers, beeswax, and simple elegance. She is the loveliest of ladies and was a huge inspiration to me with her words and presence. I completed 5 pieces of art in 2 days which in itself was amazing. As a mom I just don’t get to sit down and work start to finish on projects. Having someone bring me lunch, and no housework or anything else to do but art is a great way to live, let me tell you! But for most of us that is not our reality and I have become adept at working art around life and finding balance between the two. This piece will serve as my response to this weeks Melange Team Challenge, ‘Mom’. I used some images from my own artwork. 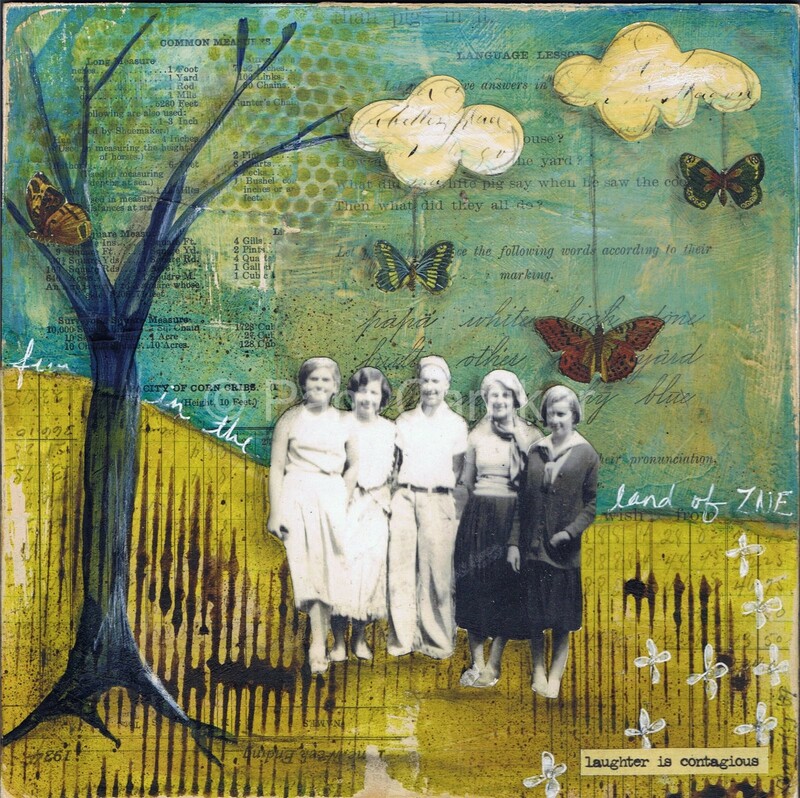 This is something I have been wanting to do and the beeswax collage is the perfect format. I was unable to scan the whole piece, which is 9×13, but this is the main portion. I will be posting more through the week there is just so much to share! OMG I am overwhelmed at your talent. I am so glad I discovered your article in cps! Wow. You just keep it up sistah! 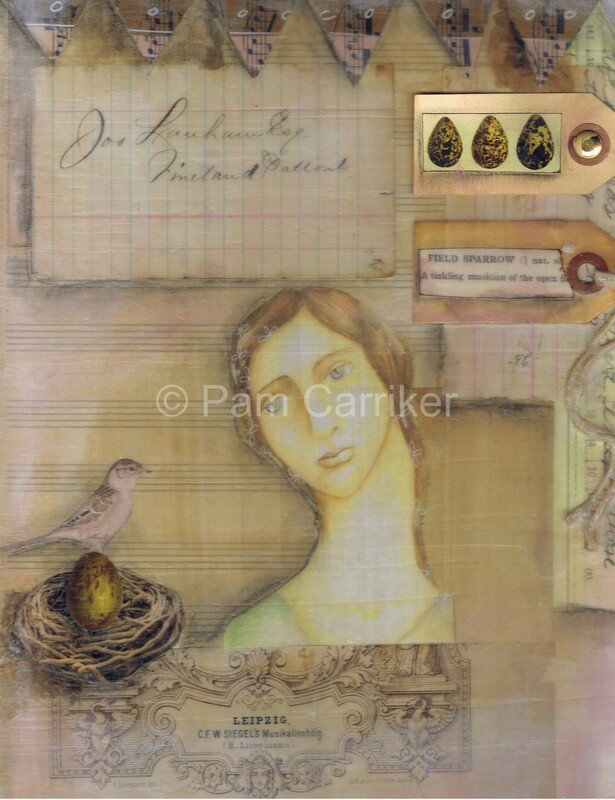 Pam I have always loved your art, the exquisite use of just the right amount of color, the depth of the layers and the expression in the faces you draw. To see it online is one thing, to see it in person, even on a small ATC in another. I just received my little gift from you – it is beautiful!! Thank you so very much. And the quote – enjoy the journey, and fly on it are perfect!! !I’m gonna place it in my Bible I think! !Blessings Pam, and Happy Mother’s Day. Pam…these are all so beautiful..what a great time you must have had…thanks for sharing with us! Pam those are just stunning. I love the use of the Beeswax. I’m still confused on it works long term though. 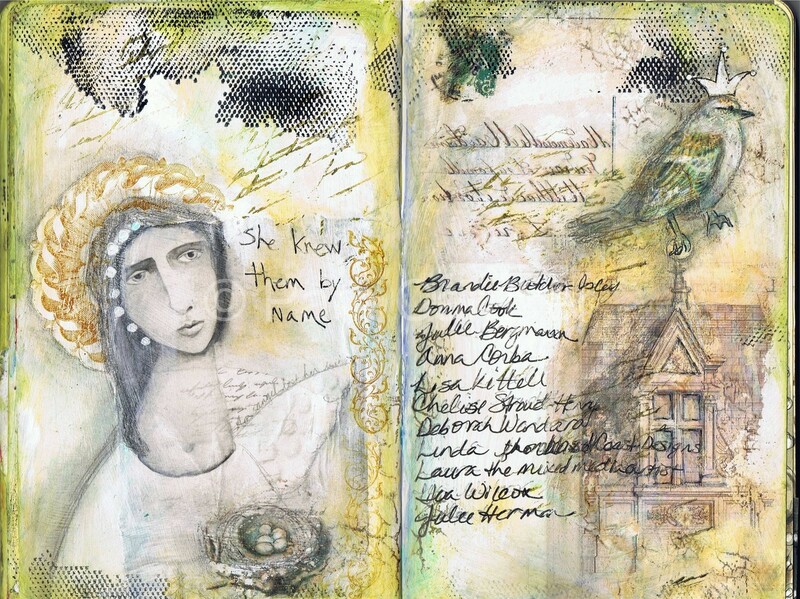 I am definitely going to try encaustic as soon as I can find some locally.Great pieces! Love the projects from you classes and your challenge piece. I will be delightful to watch where you go with your newfound techniques and classes. Your work is already so wonderful, but an artist is always experimenting and playing to find new things! It’s all really beautiful… Looks like it was a VERY inspiring convention. I am SO happy for you and am delighted that you are sharing what you can of your journey. The artwork is beautiful.I love what you did in Brandie’s workshop, and glad for you both that you finally got to meet. Pam it sounds like you had a fabulous time! I am quite envious of all the people that were able to take your class, hopefully one day soon our paths will cross…looking forward to more posts of beautiful pages. oh your artwork is wonderful, as always, pam! i’m so glad you had such a wonderful time. it sounds like you had an awesome art journey!